I just knew that there must be a way to modify the stock braking system on an MGB to provide better stopping power without having to purchase new calipers and larger rotors. I have 205/50R15 racing compound tires, and they offer plenty of stopping traction. Even with a fresh and complete rebuild, the stock brakes in combination with braided-steel hoses and all new lines just didn't offer the pressure and feel that I wanted. Mind you, I have a Mark II (1971) MGB with non-servo dual line brakes. I don't want the soft feel of power brakes, but I also don't want to have to use both feet to lock them up! 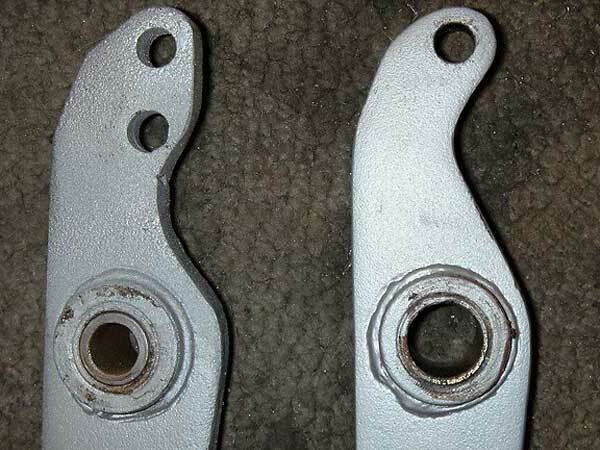 Photo 2 illustrates how I modified an MGB master cylinder bracket (or "brake box") to achieve thirty percent more braking power with the same pedal pressure. 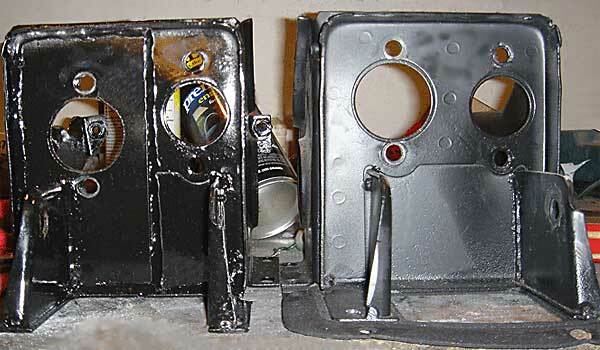 You can see the modified brake box on the left. Notice how a plate has been welded to the front surface of the box to relocate the master cylinder 1/2" lower than stock. Welding the plate to this side of the brake box was important. The idea was to lower the mounting of the master cylinder without changing its mounting plane. I selected a master cylinder mounting plate from www.speedwaymotors.com (part number 916-41025) for about $15, but you could make your own relatively easily. The plate was made from 3/16" thick cold rolled steel, and came with pre-punched holes for mounting dual brake master cylinders and also one clutch master. I just cut it down and used the portion I needed. The plate actually wraps around both sides of the pedal support (shown projecting toward the viewer). I chose to MIG weld the plate all around its perimeter. Photo 3 illustrates how I modified the pedal. Some material was welded on to allow the same mounting depth for the master cylinder attaching point. Then, a new pushrod attachment hole was drilled at a height calculated to provide pushrod alignment. (Note: if you don't relocate the pushrod attachment hole lower in the pedal, the master cylinder pushrod will be misaligned and will certainly bind. Notice also that the brake light switch was designed to contact the pedal higher than the newly drilled pushrod attachment hole, so you mustn't trim off the top of the pedal. Don't ask why I even bring that up! The relative position of pushrod attachment is what determines pedal ratio. Measure the distance from the center pivot of the brake pedal to the center of the footpad, and then divide by the distance from the pivot hole to the master cylinder pushrod attachment hole to calculate "pedal ratio." The total effect of this modification was to increase the pedal ratio from the stock ratio of 4.35:1 up to a new ratio of about 6:1. It would be very easy to do locate the master cylinder and attachment hole even lower to produce an even greater ratio, which would result in even easier braking effort. The "feel" of this change could be best described as half way between stock brakes and power brakes. The pedal is much more responsive and lighter in feel, but not soft by any means. Pressure at the calipers is increased from a stock 1227psi to a nice 1644psi. I don't have any issues with wheel lock-up and it performs flawlessly. This could be a do-it-yourself job for nearly anyone with a MIG welder and the knowledge to use it. It can be accomplished for about $15, and it provides the cold stopping power you would expect from a very expensive "big brake" upgrade kit. Disclaimer: This page was researched and written by Jeff Schlemmer. Views expressed are those of the author, and are provided without warrantee or guarantee. Apply at your own risk. Please especially note that this article suggests a deliberate compromise between (longer) brake pedal travel and (increased) braking force as can be accomplished by increasing mechanical advantage in the pedal assembly. Although Jeff reports excellent results in his particular application, this compromise may be ill-advised for your application. For example, you might find an insufficient safety margin of pedal height remains for dealing with a ruptured brake line, heat-related brake "fade", or air trapped in the brake system. There could be other un-foreseen safety problems. For further information we recommend "Brake Systems - OEM and Racing Brake Technology" by Mike Mavrigian and Larry Carleys and "Brake Handbook" by Fred Puhn. Brakes are critically important safety equipment. If you're uncomfortable working on brake components take the work to a qualified professional. Photos by Jeff Schlemmer. All rights reserved.